Mum on the Run - A bit of an outfit miss - it's all a bit too much thigh heavy for my liking! I've been caught! In the pub no less - and at lunchtime. Outrage! We had a lunchtime birthday celebration for a friend the other day in a fantastic independent local pub which serves pots of tea, with jammy dodgers. They also serve food on tin plates and have jars of sweets plus cakes on the bar - now that's my kind of pub. Anyway, a short trip out like this is always a good opportunity to try out something different, so I wore these Frye boots which I bought from Topshop in a sale so many years ago now that I can't even remember how long ago it was. I do remember however that they were reduced from well over £200 to a lot less than £50. I put them with fine blue cords from GAP, Reiss pea coat, Boden leopard print bag and Oasis print scarf. It was OK but more of an outfit miss than a hit - all of which I am happy to share. I'm not really a fan of wearing skinny jeans in boots - for me it all becomes a bit too much about the thighs! Next time I will try them with high waisted wide leg jeans - true Dallas style. Speaking of which, it's going to start soon so I'm off - oh how I love that programme! Mum on the Run - These boots are made for walking! In today's post I am sharing with you this week's article for Easy Living Online which is all about boots you can walk in - not ones you can just take teeny tiny steps in but ones you can actually walk in! I know that like me, for many of you this is a major consideration - that and comfort in general, whether it's because you are racing around after small children, walking to and from school or on your feet all day at work. Inevitably some boots have heels but the ones with the highest heels are the ones in which I have walked the further distance, so I am happy to put my money where my mouth is! I hope that you enjoy it. I would love to hear from anyone who has found a fab pair of boots that look great and which they can wear all day. Mum on the Run - Wearing a little bit of Mint Velvet (but really it's all about the brand). Do pop by, I think you might like it. I seem to keep getting myself in hot water at the moment, with many of you emailing me to tell me that I keep putting temptation in your way - in which case you may want to look away now. I am sure that many of you will be familiar with the brand Mint Velvet, which was set up three years ago now by three women who each had 15 years experience in the fashion industry. As busy working women, their aim was to create a womenswear brand that consisted of beautiful textures, which referenced the season's key looks and which translated into effortlessly wearable co-ordinated pieces. For me the brand goes from strength to strength. I think that the price point is good as is the way that the trends are interpreted to make them accessible. I have always looked to Mint Velvet for leather jackets and their strength lies in creating key pieces in a neutral colour palette which will integrate effortlessly into an existing wardrobe, updating it without screaming "hello, I am this seasons' newest trend." Their selection of squishy, slouchy bags together with their snake print clutches are perfect. Think Jennifer Aniston in her jeans/leather jacket/slouchy bag combo and you won't be far off the mark. If Mint Velvet isn't somewhere that you have previously looked for boots then I urge you to do so. They have a fantastic selection which includes knee high biker boots (quite hard to find and for some ladies preferable, as they finish at a more flattering point on the leg), shoe boots, wedge ankle boots, tan heeled boots, riding boots, over the knee boots, the list goes on. The Mint Velvet Magazine is also fantastic - full of useful styling advice, hints and tips - quick and consise, it demonstrates that the creators of Mint Velvet have a real understanding of what women want on a daily basis. I could go on but I won't, instead leaving you to take a look at your leisure! Earlier in the summer - in fact it was a very rare and hot day - I was approached by Mint Velvet to ask whether I might like to do something with them. Roll on a few months and I chose some pieces from the current collection to try. Here I am wearing their storm nubuck ankle boots. The heel height appealed to me, as did the colour. Being a dark grey, they have the tendency to take on whichever colour they are put with, whether it's navy, grey or black - which makes them so versatile. The rubber sole also appealed to me for its non-slip quality! In this outfit I styled them with skinny cords, a denim shirt with striped top underneath and a cream cape. If time had permitted (and if they were mine) I would also style them with a dress with a leather jacket over the top, or with wide legged trousers, printed blouse and a blazer for a smarter look. However, the boots were required back in London for a photo shoot and I was required to get packing for our trip away. Please forgive the beer bottle by my feet! Without me realising it, the nice man from Amazon had emptied our recyling bin and turned it upside down so as to hide a package for our son's birthday. Fortunately he chose the right day to come - on another day there could have been far more beer bottles in it. ...which reminded me very much of a bag by Tom Ford (see below) which has found favour with the A-listers. Despite my failure to style it particularly well (the colours weren't quite right), I am showing you a picture of it in any event. Alas the bag went back with the boots, so I couldn't re-do the shots - but I think you can get the gist of how it looks. I hope that you enjoyed the read and that you find Mint Velvet to be a brand which works well for you. There are some stand alone stores and there is also a concession in House of Fraser. Much as I have enjoyed having some time away from wearing fancy pants clothing and accessories, it's nice to get back to some bling. I suspect that most of us have something hanging in our wardrobes whether it be a crew neck jumper, a plain black dress, or an evening dress which has had many outings, which could have a little life breathed back into it by the addition of a new piece of jewellery. If you have any events coming up for Christmas, rather than buying yet another LBD why not tweak one that you already have, by having it shortened for example - and then spending some of your budget on a knock out piece of jewellery which you can wear all year round? It will work much harder for you than another LBD. 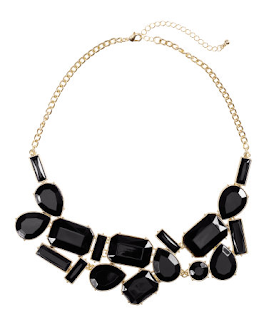 I love this H&M necklace (£7.99) which also comes in lime green. It's a fantastic price and adds just a little bit of colour to an outfit without screaming "statement necklace." 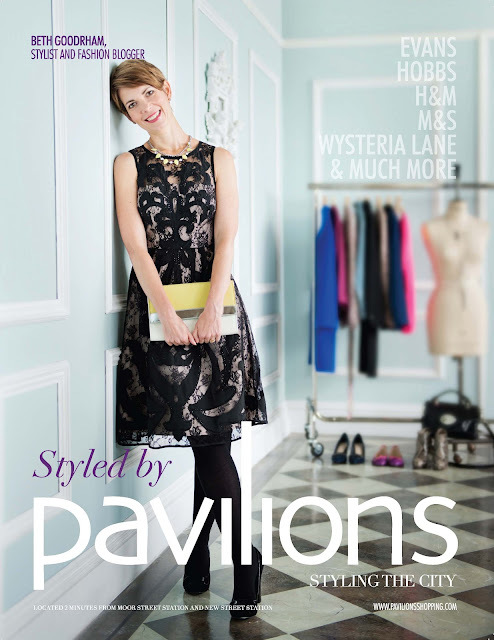 I have the precursor to this necklace, which I wore with a lace black dress from Monsoon for the Pavilions campaign. I wanted to add some colour to the dress and I liked the combination of the black and yellow/green together (although it showed up more in real life)! Equally, I wore it today in a much more casual way, styled with black trousers and grey and yellow knits. 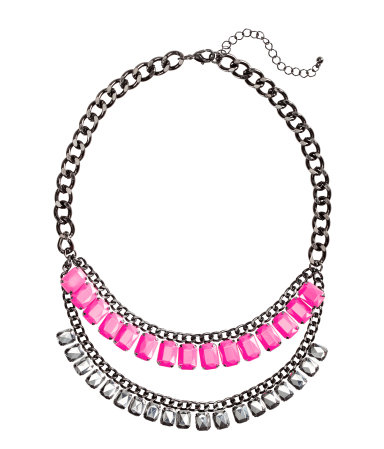 Staying with H&M, I like this H&M necklace (£9.99) which also comes in bright pink. It's a great price, particularly for a first foray into something which may be slightly different. The black would be fantastic over a black jumper - tapping into this season's trend for mixing different textures of black together. Equally, it would look great over a hot pink or bright yellow jumper, whilst the pink would add interest to a black/navy/grey top or knit. This pretty Zara gem necklace with bees (£19.99) has lots of lovely blue and green shades in it, which make a refreshing change from pinks or neons as accent colours. Also great for anyone who has a particular affinity for bees! 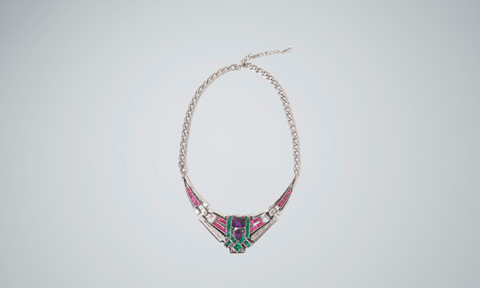 I thought that this Zara art deco necklace (£17.99) was a lovely piece. With the potential to look much more expensive than it is, it would make a great talking point. Again it would look fantastic worn in the evening with a silk shirt, skinnies or wide leg jeans and heels, or in the day time with a simple knit, jeans and ankle boots. 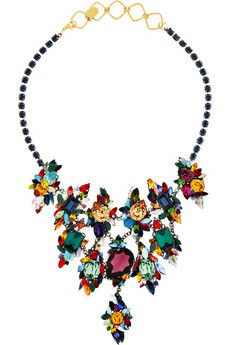 This Lulu Frost Sandra necklace (£150) is part of the fantastic collaboration by Lulu Frost for Whistles. It's such a beautiful piece which also has an art deco feel about it. This one is possibly more a special treat or for the Christmas list, as opposed to an addition to your basket whilst whizzing round the shops one lunchtime but who am I to say who should buy what and when?! I would love to hear from anyone who saw it, fell in love with it and bought it on the spot! Now I'm not really a dangly ear-ring kind of girl, instead sticking to diamond studs from my husband but if I were to branch out (which I should) I would head for these Lulu Frost Sandra ear-rings (£70). Again part of Lulu Frost's collection for Whistles, they are real beauties and would certainly pack a punch to a plain and simple outfit. Given that I am doing a post on bling, I thought it right to include some serious bling, both in terms of size and cost and this little number from Erikson Beamon (£1,135) from Net a Porter certainly satisfies both of those criteria. Mum on the Run - Just one outfit from my casual Wales Wardrobe! The trouble with not doing any washing for five days is that when you get home, there's five days of washing to catch up on. When there are five of you, that's a lot of washing. Hence the late post. I thought it only fair that I brought you at least one outfit of what I wore this week. To be perfectly honest there was very little variation throughout the week and today's outfit was the nearest that I came to wearing a dress. It's a Cos shirt dress that I wore over jeans. It's just possible to see a little bit of hot pink poking through at the neck which came from a long sleeved top, also from Cos, which I layered underneath the shirt dress. I then worked in a chunky cardi and long Lola Rose scarf over the top. Here's a closer look at the neck tie on the shirt dress - and that's about as girlie as it got for me all week - but I plan on making up for it tomorrow! I was convinced the other day that something amazing (and unheard of) was about to happen. There we were, sitting in a coffee shop with everyone doing what they should. The youngest was singing, there were no elbows on the tables, no runny noses, no fighting. To be invited to feature on the Jigsaw blog was pretty much a dream come true for me. For the first installment of their "Insider Edit" on 2 October, Jigsaw featured their US Fashion Writer, Heather Toner. 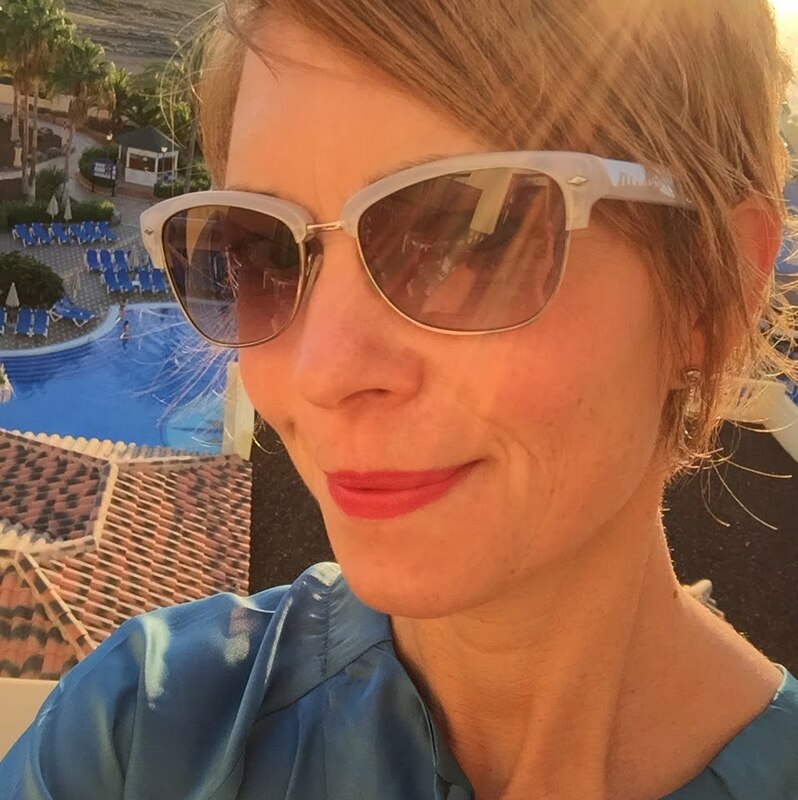 Given that Heather is based in the LA office, her weather is very different to ours in the UK and she wrote about the trends "Boy Meets Girl", "Layer It Up" and "Jewel Toned Gems." The Jigsaw stores are such that I have always taken great comfort from being in them - they just allow me to step off the world for a few minutes. Not only that of course but I love what's on the rails and always have done so since I was introduced to Jigsaw over 20 years ago now. For their second installment of the Insider Edit, I was asked to choose three of my favourite trends and write about them, selecting some pieces to illustrate them from Jigsaw's new collection. I wrote about "Country Heritage", "Luxe Leather" and the "Little Black Dress". The shoes that I chose to go with the LBD are unfortunately no longer available (great for them as they have sold out)but Jigsaw have made a lovely substitution on my behalf. For a closer look at the feature, please click here - hope that you like it! When I came across this raspberry yesterday I thought that it deserved to be shared with the world - so here it is! I wondered whether heart shaped raspberries were, in fact, a common occurence but on checking the rest of the punnet, it seemed to be a one off. I just thought that it was so cute. From my own experience, and from styling many others too, I know how difficult day time skirts can be. Not only are they, at the very minimum, a two piece outfit (as opposed to a dress which can be a one piece outfit) but there's the whole issue of the right shoes, how to accessorise and so on. So, this week's article for Easy Living online looks at five different styles of skirts which can be worn in the daytime, together with style tips on how to wear them. Obviously not every style will suit every shape but there should be something for everyone and hopefully you may be inspired to try something which you may not have done so otherwise. An image of a true bell shaped skirt was hard to find, so you may need to imagine it in another colour - but it is a shape definitely worth giving some consideration to. I hope that you enjoy the article and that you find it useful. Thanks for reading! Mum on the Run - Could these be the perfect Smoking Slippers? An opportunity presented itself to me last week to have a quick whizz around the stores and of course Zara beckoned - and loudly too! Many of you may remember that I have done a complete volte face on the smoking slipper front and having gone from loathing them to quite liking them, it was just a question of finding a pair that did the trick. I have tried on many pairs over the last few months from Primark (sparkles), to Topshop (metallic lace), to River Island (tapestry), to Clarks (leopard print), to Steve Madden (studded), to Jimmy Choo (sparkles) and Jeffrey Campbell (studded) - but none of them have quite hit the mark. However there was something about these Shiny Slippers (£39.99) from Zara which made my heart skip a beat. First, I loved the simplicity of them - black with a touch of sparkle, they are both chic and versatile. Whilst probably not the most hard of wearing shoes, I have boots for the more challenging weather. Secondly, when wearing them it felt as though I was wearing a shoe, rather than a slipper, which is how many of the other styles felt. The sole was substantial enough and with a separate heel, albeit slight, I didn't feel as dumpy in them as some other styles. The fact that the fit was good also helped. Being a size 5.5, a 5 is often too small and a 6 gapes too much - which is a really bad look. I also really like these Zara studded pony skin slipper (£49.99). In fact, like many other brands, Zara has a whole array of different styles so if you are thinking along the smoking slipper lines, I would strongly suggest checking Zara out. Here's a link to the Zara page so that you can take a look to see if there's anything that you like. Hope that you do! I was really disappointed not to be able to attend the Seasalt press day for their S/S '13 collection and wasn't entirely sure how I was going to be able to post about it given that winter was approaching. However, the perfect opportunity arose today. Not only were we in Wales and about to hit the beach but it was also sunny - not just a little bit sunny either - but proper sunny, which didn't make writing about summer clothes seem quite so inappropriate. This was the view that greeted us on arrival at the beach. Pure unadulterated sunshine - bliss. This is Newborough beach on Anglesey - one of our favourites. The inspiration for Seasalt's S/S '13 collection came from the Scilly Isles, which hold a special place in my heart as I had a holiday there in my late teens. Sophie Chadwick, who is the textile designer for Seasalt, has family who orignate from the islands and the collection reflects the colours, flowers and prints of the five inhabited isles of the Scilly Isles. The collection includes stripes to reflect the maritime history of the islands and floral inspiration is reflected in the chambray fabric in "Poppy". The bag that I was sent is great - reversible with a gingham print on the inside, it has a zipped pocket for things that you don't want to get sandy - (ie eldest's ipod which she has just managed to unlock, having locked it for 42 years (no kidding))! I was also kindly sent a lip balm and scarf, neither of which I have used yet. However I have heard from many SG readers who like Seasalt and even my sister has mentioned it to me, which is a great accolade for any brand because she is as dis-interested in clothes at is possible to be, short of not bothering to wear any at all. 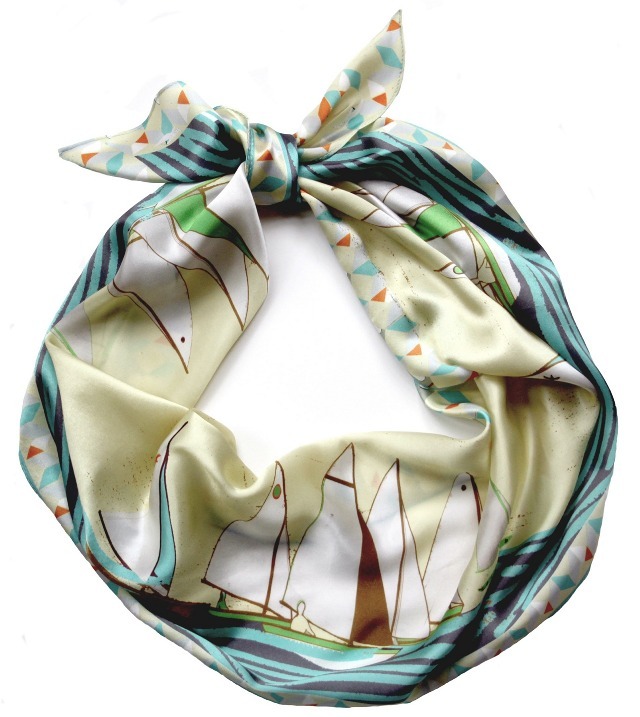 ...together with a few more which are inspired by the artistic heritage of St Ives, Cornwall. 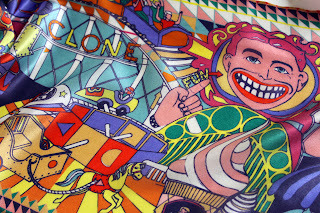 The Seasalt team comprises fashion designers, fine artists, illustrators and creative writers. Thank you to Seasalt for my press pack and information about the new collection, which I can't wait to see in the stores which will probably in the Guernsey stores when I am next over there - such a lovely place too! Here is a pic of the kind of things we get up to when on holiday. Mr SG found a magnifying glass which I had taken to the beach and he reverted to type by trying to light a fire with it - which he did with great success. I was never quite so inventive as a child - rather we pinched matches to light the fires in our dens! I doubt that would ever happen these days. Military is a look which comes around every winter, so how it is ever billed as a new trend I am not quite sure - but there you go! This is my take on "modern military". I'm not really a fan of a full on military look - like most looks worn head to toe, they just look too contrived - but a good old nod to a trend never goes a miss and the colour and style of this skirt do just that. I bought this Jigsaw Trench Tie Skirt, now reduced to £45 (sizes 8 and 10 only) at the end of the summer and fortunately it's substantial enough to wear even though it is now a little chillier. I put the skirt with this sparkly Warehouse jumper - I think that sparkles are a nice contrast to what is essentially quite a harsh trend - it just softens it a little. I also added in black tights, black heeled loafers, my Oasis cream leather jacket and Marc Jacobs bag. The silver detailing on the loafers also nods quite nicely to the military trend but that is more by luck than design. 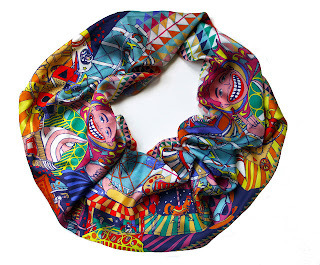 Style Guile Smile - Beautiful digitally printed silk scarves by new brand Red Brick - there's definitely room in my wardobe for one of these beauties! Sometimes I come across something which makes me sit up and take notice. When I followed the link in an email sent to me by Karen (a graduate of the Royal College of Art) of Red Brick I was totally bowled over. The vibrant colours and designs of her scarves are amazing, as is her jewellery. "I did my first degree in jewellery at Edinburgh College of Art, and then went to the Royal College of Art in London and studied a Masters in Jewellery Design. During my time there, I worked on jewellery designs for various fashion brands, ranging from River Island to Margaret Howell. I also worked as a design assistant to the accessories designer and prop stylist, Fred Butler. I decided to launch my own line on the premise that great design should be accessible to everyone. I used to get really frustrated that I couldn't afford the unusual and individual designer pieces that I really loved, but there didn't seem to be an alternative apart from high street copies. I try keep my prices as affordable as possible, whilst maintaining a high quality of product. 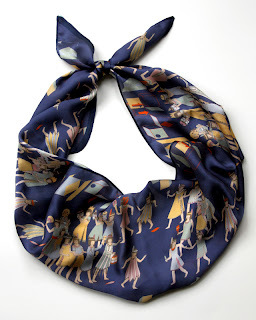 I think people are very careful about what they buy at the moment, and I think my pieces cater to this. 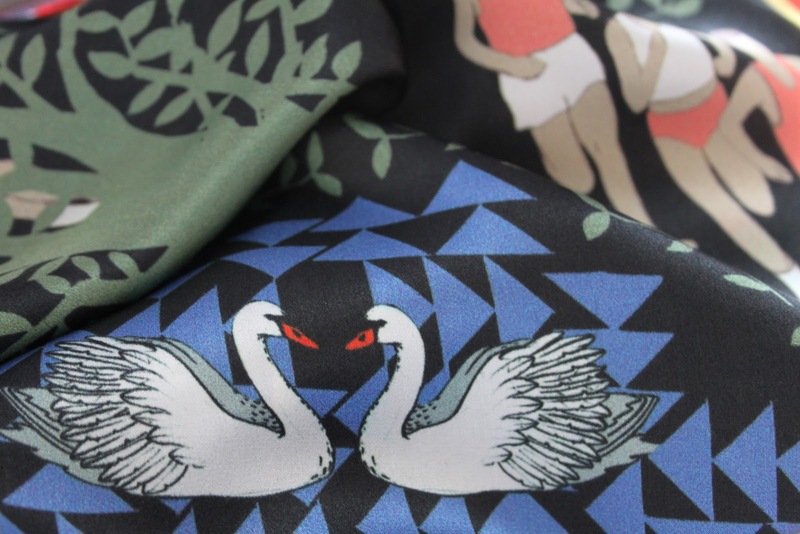 I absolutely love the sense of humour in high fashion brands like Moschino, Miu Miu and Marc Jacobs, but I try not to look too closely at other designer's work when generating ideas as I like to come up with something completely different. 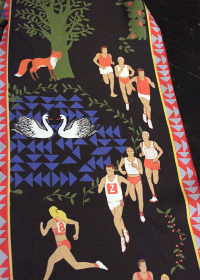 Instead, I look at printmaking and graphic design, and I love British artists like Peter Blake and David Hockney. I also love car boots sales for picking up old scraps of fabric or old interiors magazines! I use digital fabric printing on 100% pure silk to make my scarves. I make each colour separation by hand to try and retain some of the pencil marks and give the digital print a richer quality. I always give my friends samples of the prototypes to try out and listen to their feedback on their wearability, the colour choices, etc. It's really important to me that the pieces are comfortable and practical to wear." 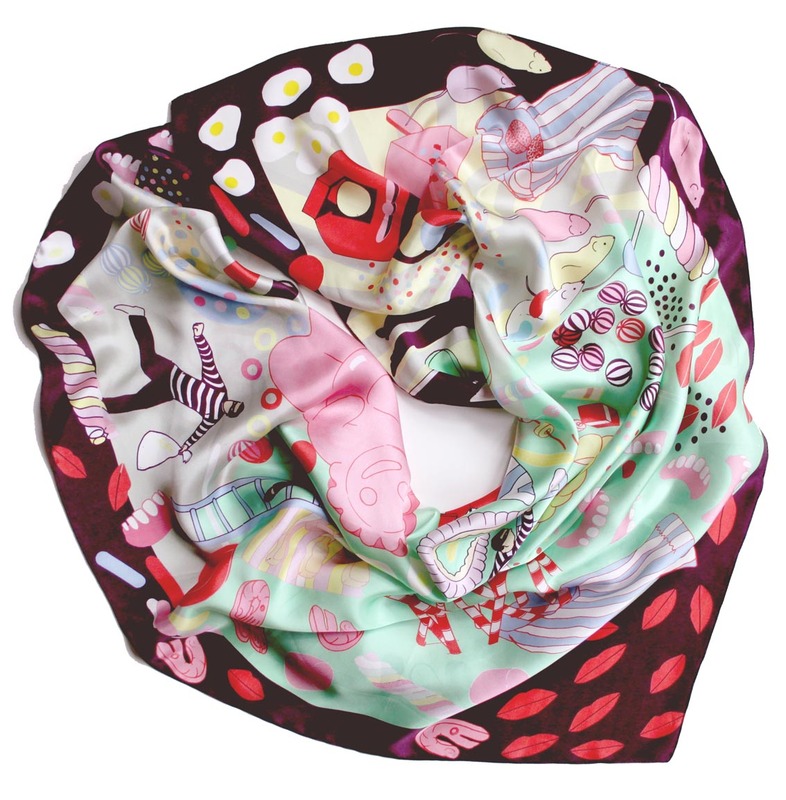 I can see these bright scarves really adding something to a simple weekend outfit of jeans and a jumper, or to a dark winter coat. Personally I think they offer something slightly different that is quirky, individual and made by someone with incredible talent. Just so that you know, I haven't been paid to write this post - either in scarves or anything else! Mum on the Run - a new shaped dress to try??? Occasionally a new style of dress comes along which slowly starts to gather pace and over time, becomes more and more popular. This season the drop waist dress is creeping into our consciousness - bear with me on this one - I am going to give you a few different options! Clearly this style dress isn't going to be for everyone - I get that - but if you can get over the mental image of wearing one whilst dancing to "Come on Eileen" or "Hey Mickey" then it might be worth trying one. Jaeger Boutique has several dresses in this style and they seem to have adopted it as a mainstay this season. 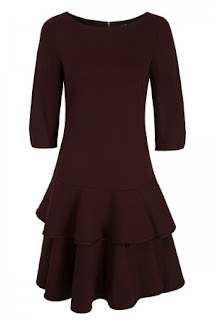 First of all there's this Emma Drop Waist dress (£120). It's simple, understated and doesn't scream "look at me". I would keep the outfit simple, maybe adding a necklace or chunky cuff and heels - perhaps shoe boots - and for me that would be that. For someone with giraffe like legs, I would love to see this paired with some amazing open toe shoe boots which come slightly higher up the leg - not a look I could pull off. 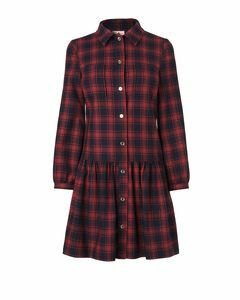 For a more casual take on the look, also by Jaeger Boutique, there's this Jessie check wool blend dress (£120). This gives a nod towards the heritage trend. It would need to be styled with edgy and sophisticated shoes or boots and accessories or else there could be slight cowgirl connotations. I wouldn't attempt this dress, preferring the above one instead - but I have no doubt that others could pull it off. The third dress by Jaeger Boutique is this Cindy Jacquard Spot Dress (£160). Clearly here it is styled in a really youthful way (which I must admit to finding slightly disturbing) but if the ankle socks and pink shoes were lost and again replaced by something altogether more edgy and sophisticated, it could take on a whole different look. For a more grown up take on the trend, you could look to thisRockefeller dress merlot (£275) by the Fold, London. Slightly longer in length, and with the addition of sleeves, this may be a more appealing option to some. Below is a picture of Victoria from Feathers and Frills wearing the above dress, which looks fantastic on her - really elegant and just a little different. What glossy locks too! Finally, again from Jaeger Boutique, there's this Jersey swing hem dress (£180). 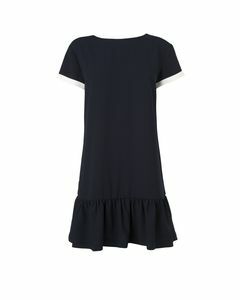 It's not a drop waist dress but is of a similar silhouette to the above styles and could be styled in exactly the same way, enabling you to reference the look, without taking it on head on. 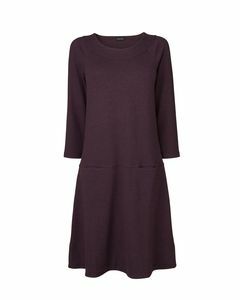 Are any of you tempted by a drop waist dress? I have one in a bag right by me waiting to be tried. I'm not going to promise to share the looks with you - but I will report back in due course. Mum on the Run - In a skirt that I like but which I have no hope of walking in! Sometimes you just have to laugh. To cut a long story short, I got into the back of the car with the youngest this morning to brush her hair. Forgetting that the childlock was on in the back, I had to find another way of getting into the front to open the door. There was only one option - and that was to climb. Now this skirt is possibly the most ridiculous item of clothing ever designed because you can't actually move in it. Add heels into the equation and it was more a case of launching myself into the front. Somehow I managed to twist around at the same time, which left me sitting on the horn. Oh well, I suppose that laughing is a great way to start a day. As to the outfit, I bought this navy velvet skirt from Topshop last year. Way ahead of its time, it has a (p)leather waist band. Long and straight, it is a nightmare to walk in but I like the line and feel of it. I put it with a white shirt and pink Mulberry, which I turned into an oversized clutch by putting the strap inside. I wore it with a warm Reiss biker style jacket when out and about together with heeled ankle boots from Clarks. Note to self: Tomorrow I must wear something I can move in with ease - just in case I make the same mistake with the whole back of the car/childlock situation! 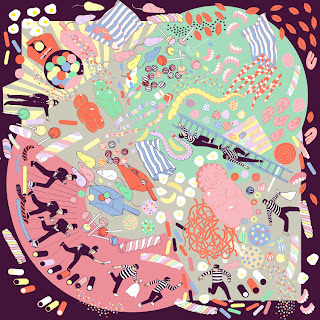 Mum on the Run - Am I wrong to love this? Mum on the Run - 5 pairs of lovely shoes!